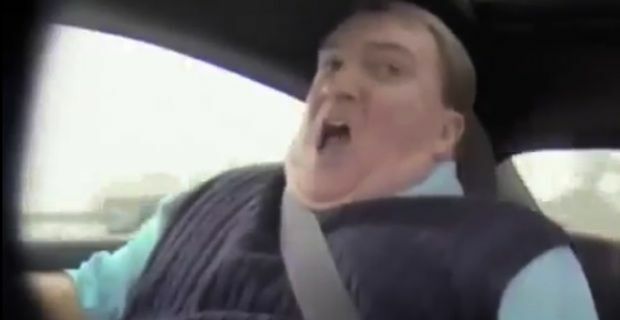 Candid Camera inspired prank TV shows like Punk'd, Boiling Point, and Scare Tactics and Pepsi decided to use a prank to market their Pepsi Max and had four time NASCAR champion Jeff Gordon take an unsuspecting car salesman for the wildest and scariest test ride of his life to sell their soft drink. The popular American driver disguised himself with a fake beard and moustache and even had wrinkles added to his face to make himself look older and less recognizable, and heads to a used car dealership and begins to timidly look at a Chevrolet Camaro while the salesperson, Steve thinks this is going to be an opportunity to sell the high performance sports car to this mild mannered customer named Mike, who drives a minivan. Despite Gordon protesting that he might not be able to drive such a powerful car, as he gets behind the steering wheel with the salesman at his side and using a video camera, which is naturally hidden in a can of Pepsi Max, and captures all the salesman’s horrified expressions, threats, screams and few choice curses as he hangs on for his dear life as the initial bumpy start turns into thrill ride complete with high speeds and hair raising stunts. The hilarious video immediately went viral and so far has garnered more than 1.8 million hits on YouTube since it was uploaded by Pepsi on Tuesday, but as in all viral ads, it raised numerous debates on whether the whole thing was setup and that Steve the salesman was in on it. If you enjoyed the commercial then don't read on, because we don't want to spoil your fun with what actually happened behind the scenes, which wasn't as spontaneous as it seemed. Regarding the commercial, Wayne Troutman, the dealership owner, interviewed by syndicated show Right This Minute said that the video shoot took all day and that Pepsi even supplied the Chevy Camaro, while a local North Carolina newspaper revealed that it wasn’t even Gordon doing all the the driving, but racer Brad Noffsinger, who works with the Richard Petty Driving Experience, who did the slides, burnouts and the rest of the stunt work.